KidZania is a children’s edutainment theme park at the Dubai Mall in Downtown Dubai. It offers youngsters the opportunity to experience adult life through role play in a child-sized city. The city offers a full range of establishments found in a real city such as a hospital, police and fire stations, restaurants, a supermarket, factories, a theatre, construction site, and beauty salon. Many of the businesses are sponsored and branded by real companies and this actually adds an element of realism to the experience. Children enter KidZania by checking in at the Emirates desks at KidZania International Airport. Here they are given a special tag that prevents them from leaving the attraction without the same adults that checked them in. On entering KidZania each child receives a cheque for 50 KidZos, the official currency, which they can change or deposit at the bank. KidZos can be spent just like real money; for example at the supermarket, restaurant or hairdressers. To earn more money in KidZania children must get a job and work. Over 80 jobs are available including barber, beautician, cabin crew, pilot, dentist, house painter, firefighter, and customs officer. Children dress up in realistic uniforms and perform guided tasks to earn their wage. 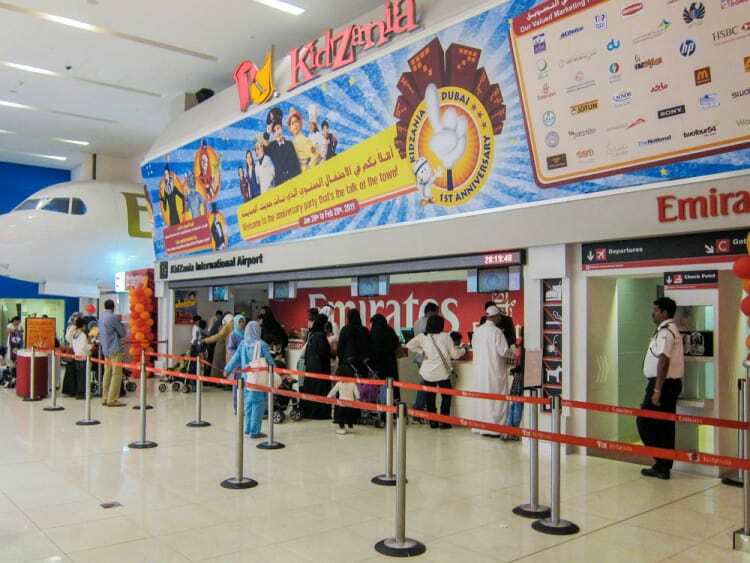 Businesses and organisations at KidZania include Dubai Customs (children check goods and luggage for prohibited items), Emirates Driving Institute (children learn safe driving rules to obtain their driving licence so they can rent a car at KidZania), TNT (children can earn KidZos delivering parcels), Coca Cola (bottling plant), Waitrose (supermarket), Britannia (biscuit factory), and Chevrolet (car dealership). KidZania encourages children to think and act independently. They are allowed to move freely throughout the city and make their own choices about which jobs to take and how to spend their KidZos. Parents of children over 120 cm in height can leave their children in KidZania, safe in the knowledge that they are unable to leave without them (smaller children require supervision). Parents that choose to enter the attraction can either observe them experiencing the activities or relax in the parent’s lounge. KidZania is open every day of the week. Opening hours are Sunday to Wednesday, 9 am to 10 pm, Thursday 9 am to midnight, and Friday and Saturday 10 am to midnight. Prices are currently 95 AED for toddlers (2 – 3 years), 140 AED for children (4 -16), and 95 AED for adults (17+). Infants (under 2) enjoy free admission. Adults must be accompanied by a child. ‘Real’ facilities include ATMs, toilets, first aid room, and some food and beverage outlets where real money is required (McDonald’s, Baskin Robbins, Pizza Express, Dunkin Donuts, and Pronto Café. KidZania is located on the 2nd floor of the Dubai Mall, close to Reel Cinemas. The nearest car park is the Cinema Parking area. 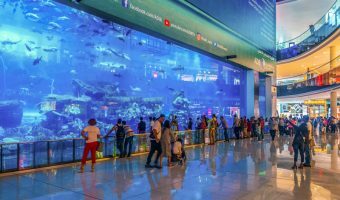 The Dubai Aquarium & Underwater Zoo (0.2 miles) - Aquarium at the Dubai Mall. Dubai Opera (0.5 miles) - Performing arts venue at Downtown Dubai. 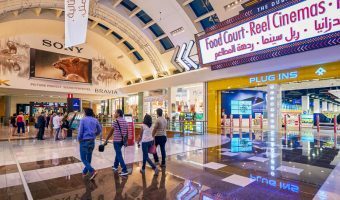 Reel Cinemas Dubai Mall (0.1 miles) - 26-screen cinema at the Dubai Mall. Reel Cinemas Rove Downtown (0.5 miles) - Boutique cinema at the Rove Downtown Dubai. Souk Al Bahar (0.2 miles) - Souk near the Dubai Mall. Entrecote Café de Paris (0.1 miles) - French restaurant at the Dubai Mall. Offers excellent view of the Dubai Mall Waterfall. Texas Roadhouse (0.1 miles) - American restaurant at the Dubai Mall. Offers steaks, ribs, chicken, and burgers. Large portions. Reasonably priced. Indoor and outdoor dining areas. Outdoor terrace offers view of the Dubai Fountain. Claw (0.2 miles) - Lively American bar and grill at Souk Al Bahar. Menu includes bucket of crabs and shellfish, burgers, seafood, steaks, and BBQ dishes. Licensed bar. Ladies’ nights, live sports, and Friday brunch. Thiptara (0.3 miles) - Thai restaurant at the Palace Downtown. Indoor and outdoor dining areas. Terrace overlooks the Burj Lake and offers good views of the Dubai Fountain and Burj Khalifa. Bombay Brasserie (0.8 miles) - High-end Indian restaurant at the Taj Dubai in Business Bay. Features an open kitchen and luxurious interior. Offers good views of Burj Khalifa. Mint Leaf of London (0.9 miles) - Contemporary Indian restaurant on the 15th floor of the South Tower of Emirates Financial Towers, DIFC. Floor-to-ceiling windows offer great views of the Burj Khalifa. Al Grissino (1 miles) - Italian restaurant on the 16th floor of the South Tower of Emirates Financial Towers, DIFC. Unique bar offers spectacular views of the Dubai skyline. Burj Khalifa/Dubai Mall Metro Station (0.8 miles) - Metro station on the Red Line. Map showing location of KidZania. Kidzania is an interesting concept that I’ve not seen in the UK. I’m sure it would be very successful there. My son has already decided that he wants to be a doctor and he is only 8. My kids loved this place. They had a whale of a time. There were so many different roles to choose from though some were more popular and they had to wait. It was very reassuring knowing they couldn’t wander off out of the building. Hey this is really a good idea. Kidzania can really teach kids the value of money or to understand the daily life problems or work etc. It is really nice that kids can understand how difficult our day-to-day life is.